Six-bedroom lounge has been updated for today’s traveler. 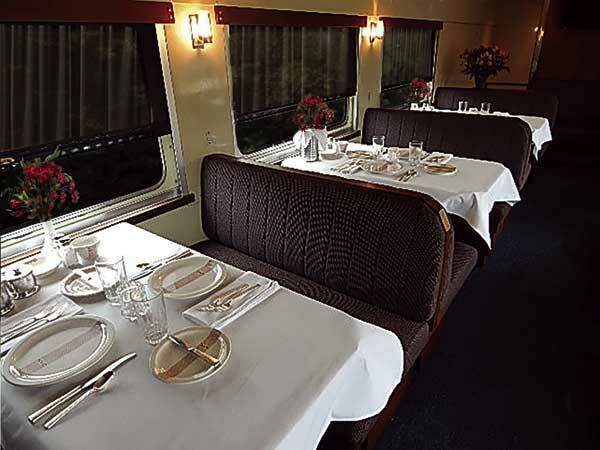 Replicates the essence of streamlined first-class rail travel while providing the amenities expected by contemporary voyagers. Complete kitchen; full sized shower room; each bedroom has a private enclosed lavatory and toilet facility. Bedrooms convert into suites; lounge seats 16 guests for meals with crisp white linens and vintage china; professionally staffed. Operates as an independent car or can be combined with another full sleeper while providing food and beverage service for both cars. Based in Kansas City Union Station, Missouri. Was built by Budd as part of a six car order for the New York Central in 1949. Through the years it has been in service for the NYC, the Penn Central, and Amtrak. It has been restored and updated by several different private owners and is currently owned and operated by NYC Investments.